This designation by AdvantageWest means that we are entrepreneurial friendly and have mechanisms in place to help a business to start, to grow and to thrive! The Haywood Community College Small Business Center is now located in the heart of the community! Located beside the college's Regional High Technology Center off of Industrial Park Drive in Waynesville, the new center location offers endless opportunities to promote small business and economic development in our community. Haywood’s Small Business Center link sbc.haywood.edu contains information about our business counseling, free business seminars, a wealth of business books and audio CD’s available for loan, the most current Guide for New Business in Haywood County, as well as, Success Stories of those business owners who have used our resources. Again, visit The Small Business Center online as an introduction to how we can guide you through the steps of starting a business, expanding a business, improving efficiency of an existing business, or simply helping you not make a business mistake. Thinking about starting a business in Haywood County or growing an existing business? Take advantage of the programs, services and resources provided by the Small Business Center. The NC Community College's Small Business Center Network assists in starting an average of more than 600 businesses each year. Small Business Centers have an economic impact in 90% of all NC Counties each year, helping to create and retain nearly 3,000 jobs annually. 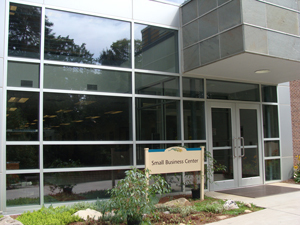 The HCC Small Business Center now offers online small business seminars at the touch of your fingertips! HCC SBC OnDemand provides flexible training opportunities at a time and location that is convenient for you.